Presenter: Dr. Paul White, author of The Vibrant Workplace, and co-author of the best-selling, 5 Languages of Appreciation in the Workplace. 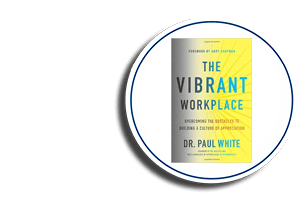 Description: While assisting hundreds of businesses and organizations implement authentic appreciation in their workplaces over the past 7+ years, Dr. White has identified the most common challenges to creating a positive workplace culture. In this webinar, he will describe the characteristics of a vibrant workplace and give an overview of the most common obstacles encountered. He will then highlight two core issues that undermine creating vibrant, positive workplaces and give practical starting points that participants can take to impact their organization positively (regardless of their position in their organization). Take practical action steps to begin to make their work setting healthier, and access resources helpful to create change within their organization.